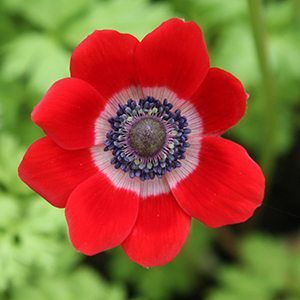 The Poppy Anemone is Anemone coronaria, best known for the St. Brigid and De Caen varieties. With a multitude of colours from white through to red s and purples, as well as double flowering and multicoloured forms they are easy care garden plants. Anemone de caen is a wonderful single flowering anemone, while Anemone coronaria or better known as St.Brigid anemones is the double flowered group. Both have poppy like flowers and prefer full sun to part shade. And why are these two called ‘wind flowers’, because they seem to ‘self sow’ as if sown by the wind. Long lasting flowers are the added attraction for florists.The papery flowers appear in spring to summer on tall stems, and Anemone coronaria grow from small bulbs. The bulbs or corms, look a little dried and wizened when you buy them, don’t fear, all that they need is some moisture for them to swell up and be ready to plant. The best time to plant Poppy Anemomes is from autumn to spring. And this will depend on your climate. In areas with mild winter temperatures, plant them in autumn. In very cold areas, start them indoors and then plant them out in spring. You can plant directly in spring however this can mean smaller and less flowers. And with these bulbs, which way up is different to many, the pointy end should be pointed downwards in the soil. Choose a well drained soil and a sunny position. Or grow them in containers. Prepare the soil well by digging in some well rotted compost and aged cow manure. Water them in well and then don’y water again until you see good growth above soil level. From planting to flowering takes around 12 weeks. So bulbs planted in autumn will flower in spring. These wonderful little bulbs will flower for around 8 – 10 weeks. Each bulb can produce over 20 individual flowers in a season. They can be used for cut flowers and will last well in a vase. Anemone Nemorosa ‘Bracteata’ is similar to the familiar A. nemerosa only but flowers are green and white. Anemone Nemorosa are winter dormant, spread through creeping rhizomes and prefer a shaded postion. A humus rich well drained soil in part shade. 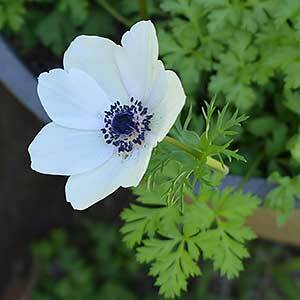 Anemone ‘Flore Pleno’ is a white double form. 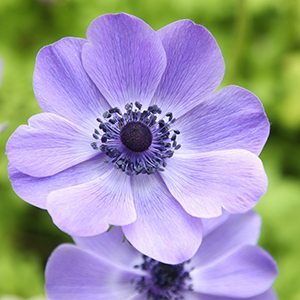 Anemone ‘Robinsoniana’ has Lavender blue petals. Anemone nemorosa x seemanii is a hybrid of A.nemerosa with pale yellow flowers. Anemone barbulata origially form China and growing to nearly 70cm. A profuse bloomer with lots of small white flowers with a bluish bloom on the back of the petals.